An undergraduate research assistant leads students through a balance check and other ImPACT tests. Concern about concussions is a topic that is gripping the sports world. 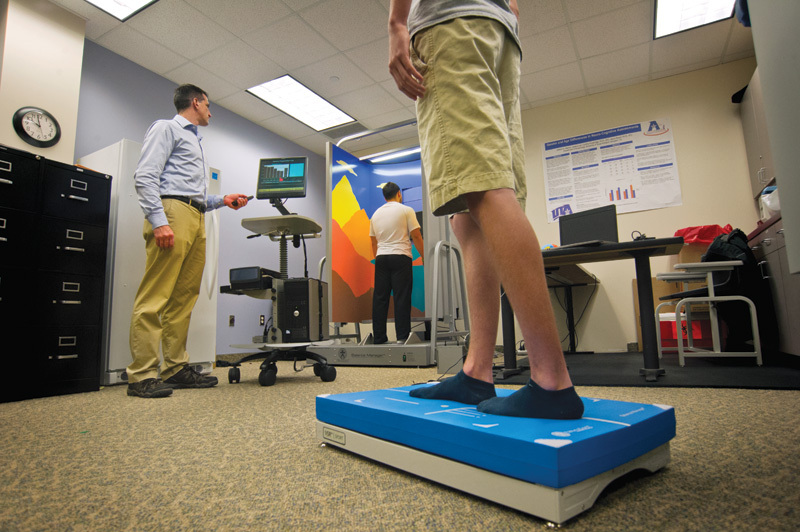 But the effectiveness of a widely used assessment tool, ImPACT (Immediate Post-Concussion Assessment and Cognitive Testing), has recently come into question, thanks to new research from a team featuring kinesiology Assistant Professor Jacob Resch. The team found that, on some factors, the test misclassified healthy participants as impaired as much as 46 percent of the time. In their paper, the researchers stressed the importance of using multiple types of assessments in addition to computerized neurocognitive tests like ImPACT, along with a clinical examination.